We are pleased to present you the NEW Natural Awakenings email marketing site. This site has been updated to allow for creating and delivering professional emails with superior reporting and analytical options. For those who have used the NA Marketing Tools in the past, please note that this portal no longer allows you to dynamically create printed materials. However, you can still order business cards and marketing materials from the company you have grown to trust for your marketing needs. The prices are the same – just the process has changed. 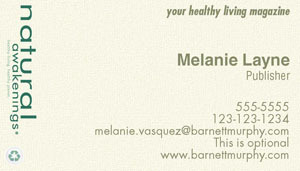 If you need to order business cards or marketing materials, please call Barnett & Murphy at 877-624-5264. 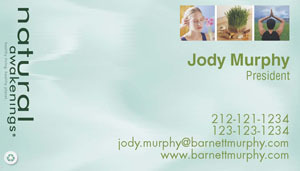 Barnett & Murphy is a full service direct marketing agency. We are happy to help you with any marketing need you may have! Explore this site and begin to enjoy the power of email marketing so advanced, it will allow you to market your publication cost efficiently and with ease. Please login using the fields below. please contact Technical Support for assistance. CALL 877-624-5264 FOR ASSISTANCE WITH YOUR PRINT NEEDS! 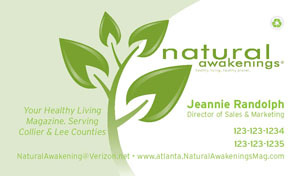 The Natural Awakenings Marketing Postcard is a printed customize postcard that can be used for marketing purposes. These can be used as a direct mail piece or shipped to you to hand out. If you would like to mail the Marketing Postcard directly, you can purchase a mailing list or provide us your own. 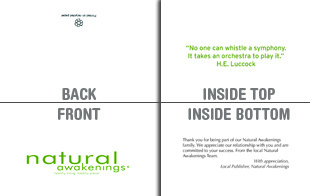 The Natural Awakenings Note Card can be personalized by you. 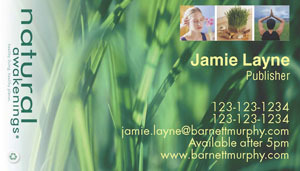 The Note Card is a wonderful way to communicate with advertisers, staff and others. 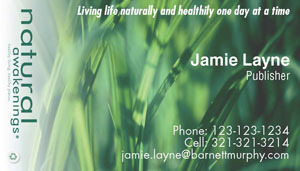 The Note Card is on recycled paper and includes a Natural Awakenings Envelope. 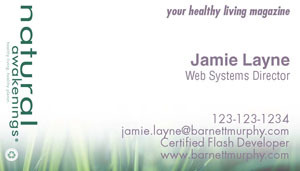 Registering for the Natural Awakenings Marketing web site is FREE and EASY! © 2008 Barnett & Murphy, Inc. All Rights Reserved.